As the proverb goes, ‘change is the only constant’ as it is in the nature of all that Allah has created to constantly change and adapt. The actual notion of change is inextricably linked to flaws and/or limitations as a thing is usually altered out of a sense of improvement. It is indeed the human need to constantly adapt and modify to be that much more efficient and better, and even when change is not needed people are driven by the need to modify something as a way of making themselves feel that they have achieved anything, however insignificant it may be. The philosophy underlining change is the search of perfection and striving to acquire it to the best of our abilities, reflecting the Prophet’s (peace be upon him) saying, “Verily Allah has ordained perfection in all things” and “Religion is easy and whoever overburdens himself in his religion will not be able to continue in that way. So you should not be extremists, but try to be near to perfection.” It is in search of this perfection that drives the Muslim to be continuously evaluative hoping that something be improved in order to reach the eventual objective, and although the objective is ultimately bestowed by God, it is the effort placed in the process and the actual attempt of realisation that is rewarded. It is this reward that those behind Islam21C seek, and so in a bid to improve, develop and advance our position as a mainstream leading reference point for Muslims of the 21st century we welcome you to the new our new site. During your exploration throughout the site you will find many new and many improved features alongside a richer offering of content to facilitate the exploration of the site by visitors in the hope that they will take full advantage of what Islam21C has to offer. The purpose of Islam21C (short for Islam in the 21st Century) is not only to provide a platform for the research wing of MRDF (Muslim Research & Development Foundation) as well as it’s various writers, thinkers, and scholars, but also to inspire and encourage all Muslims into taking a more proactive stance in regards to their religion and environment in the 21st Century through contemplation, discussion, and application. As the saying goes, ”content is king” which is why our team’s primary objective is to provide the Muslim community with guidance and solutions through content (in all it’s various forms whether articles, papers, videos, multimedia etc) that is fundamental to them understanding their place and situation in the world today. Ranging from Islamic to secular discussions we aim to revive a culture of learning, understanding and pro-activity as well as diversifying the discourse of Muslims. We are moving with the times and this new contemporary responsive site will make your time on he site more interesting and user friendly as it adapts itself according to the device you use. We have a stronger focus on content, a new team and ever expanding team of writers and new and exciting features that will make the Islam21C experience more enriching. In seven years we have become a leading online reference point dedicated to providing Islamic guidance and solutions to the issues faced by western Muslims in the 21st century, according to the agreed upon principles in Islam. In line with this aim and the number of challenges Muslims are facing not only in the West, but around the world, we needed a space on the site to highlight crucial issues at key times. Therefore, one of our new features is the ‘Spotlight’ segment. This functionality shines a light on important topics that need highlighting to the Muslim community so they may understand the changing world around them and are prepared to articulate it. We have re-organised and changed our famous main menu categories and added new sections and dedicated more space to our interactive projects and thriving social media platforms. Whilst we have introduced a number of new components, we have retained some from the old one as they proved to be popular and very helpful. There are many more new features to the site, and we hope our readers will take the opportunity to explore, interact and comment using the feature below. We sincerely hope that you enjoy exploring the new website. Whilst being very excited and honoured to offer this new and dynamic website to the Muslim community, we also offer it as a gesture of appreciation for all the support you have given this project with your resources and Dua, and as an improvement of our service to you, for your benefit. We pray that Allah make us sincere in our intentions, correct in our approach, and successful in our endeavours. Sahih Muslim, on the authority of Abu Ya’laa Shaddad bin Aws. Sahih Al Bukhari, on the authority of Abu Hurairah. It should also be noted that ‘extremists’ in the hadith refers to those who go beyond that which Allah has legislated such as he who makes six prayers legislated a day as opposed to the five daily prescribed. This hadith should not be used to support non-Islamic Western notions of ‘extremism’ where in reality an individual is only attempting to emulate the Prophet and live in accordance with divine law. Next: Preventing terrorism or recreating Islam? 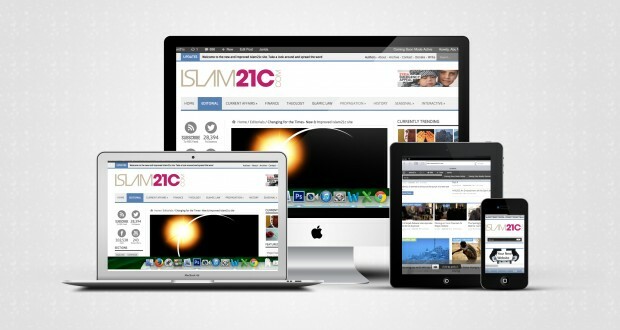 Alhamdulilah for the new Islam21c website. May Allaah reward everyone involved.